Better Buy: Enterprise Products Partners L.P. vs. Magellan Midstream Partners, L.P. It's a tough pick when comparing two of the biggest names in the midstream partnership space, here's what you need to know to make the call. The midstream partnership sector is deeply out of favor today, despite the fact that these companies provide vital services moving and processing oil and natural gas. For conservative investors, Enterprise Products Partners L.P. (NYSE:EPD) and Magellan Midstream Partners, L.P. (NYSE:MMP) are two high-yield stocks that appear to be on sale today, still off roughly 30% and 20% from their 2014 highs, respectively. Here's what you need to know to decide if Enterprise or Magellan is the better buy for you. Enterprise, with a massive $62 billion market cap, is one of the largest midstream companies in North America. Its operations are incredibly diversified, including pipelines, storage, ports, processing facilities, and even shipping operations. The vast majority of its revenues are fee-based, resulting in a very steady business. Enterprise has increased its distribution each year following the deep oil downturn that started in mid-2014. Distribution coverage was at least 1.2 times each year, a robust level of coverage, even as oil prices languished at low levels. From a bigger picture, the partnership has increased its distribution for 21 consecutive years. Enterprise really is one of the best-run midstream partnerships in the industry. And, with roughly $5.3 billion worth of growth projects in the works between now and 2019, there's ample opportunity for continued business growth and more distribution hikes. But there's a fly in the ointment, here. Enterprise is working to reduce its reliance on dilutive unit sales to fund its growth. It wants to self-fund more of its capital investments using internally generated funds. To do this, it will be reducing the growth rate of its distribution from the mid-single-digits to the low-single-digits. This is a difficult choice, but it will make Enterprise an even better partnership over the long term. And once the transition is complete, it should be able to increase its distribution growth rate into the mid-single-digits again. 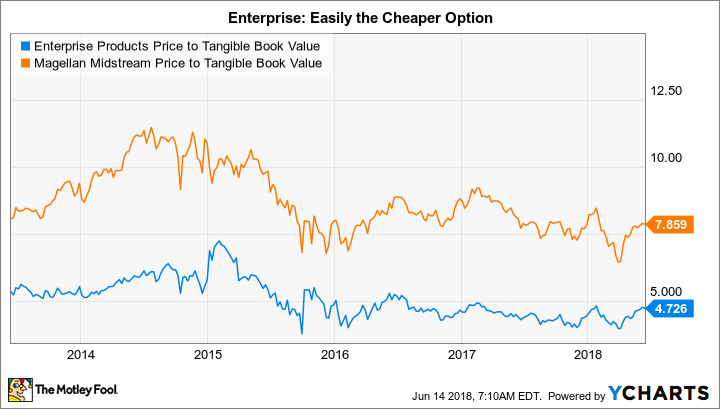 EPD Price to Tangible Book Value data by YCharts. Until that point, though, investors are going to have to deal with less-than-inspiring distribution growth prospects. This is one of the reasons Enterprise's units have slumped further than Magellan's units. However, with a price to tangible book value of 4.7 times compared to Magellan's 7.8 times, Enterprise is a much better value. Add in the fact that the partnership's 5.8% yield is 0.5 percentage points higher than Magellan's yield, and value-conscious investors trying to maximize current income might be willing to wait a couple of years for Enterprise to shift gears. For investors in search of rapid distribution growth, Magellan should probably get the nod, despite its more expensive valuation and modestly lower yield. 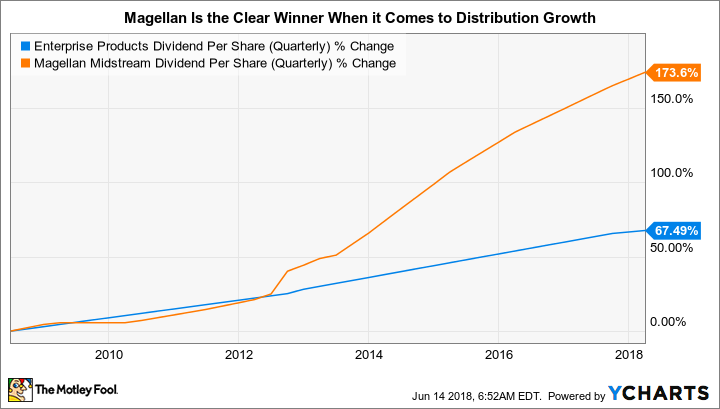 At a $16 billion market cap, Magellan is a much smaller partnership than Enterprise, suggesting that it will generally be easier to grow its business because relatively small investments can still have notable top- and bottom-line impacts. Magellan has $1.7 billion in growth spending planned between 2018 and 2020 that it expects to support distribution growth of between 5% and 8% a year. It is targeting solid 1.2 times distribution coverage throughout the span. And while not nearly as broadly diversified as Enterprise, Magellan's business is still well diversified and largely fee-based. That's supported distribution increases every quarter since it came public in 2001. The annual streak is up to 18 years. Magellan is also one of the most conservatively financed partnerships, with its debt to EBITDA of 3.45 times near the low end of the industry and below that of Enterprise's 4.27 times. Note that current capital spending is likely to push Magellan's ratio up toward 4 times, as the company looks to maintain its distribution strong coverage ratio. But that's still at the low end of the industry average. Magellan, in fact, has long traded at a premium valuation compared to its peers. One of the key reasons being its rapid distribution growth. The graph above shows you just how important this has been, with its distribution expanding by more than 170% over the past decade compared to a roughly 67% increase at Enterprise. In the end, the real question to ask when comparing Enterprise and Magellan isn't which is better -- they are both good investment choices for even the most conservative of investors. The question is really about what you're looking for. Put simply, you will have to be willing to pay a premium for Magellan's higher distribution growth rates. If that sounds like a worthwhile trade-off, then Magellan is the right choice for you. Based on the fact that the distribution yields are so similar, this is the choice I prefer, despite the company's relatively lofty price. However, value-conscious investors would probably be better off with Enterprise, even though there's likely to be a year or so of slow distribution growth ahead. Once it makes the transition to more of a self-funding model, distribution growth should pick up again (though likely still not to Magellan-like levels). And, at that point, it is reasonable to expect investors to reward the units with a higher valuation. In short, if you like bargains, Enterprise might be the better pick.